Tudor pride ourselves on being an inclusive, family society. We enjoy being able to offer performance opportunities to young and old. Our experienced production team and committee aim to provide an enjoyable experience for all, whilst producing shows of the highest possible standard for our audiences. For information on our society, our current or upcoming productions please contact our chairman on charlie@tudormcs.co.uk or our Director on faye@tudormcs.co.uk. “Sister Act!” is the feel-good musical comedy smash based on the hit 1992 film that has audiences jumping to their feet! Featuring original music by Tony- and eight-time Oscar winner, Alan Menken (Newsies, Beauty and the Beast, Little Shop of Horrors), this uplifting musical was nominated for five Tony Awards, including Best Musical. Filled with powerful gospel music, outrageous dancing and a truly moving story, Tudor’s “Sister Act!” will leave you breathless. A sparkling tribute to the universal power of friendship, “Sister Act!” is reason to REJOICE! 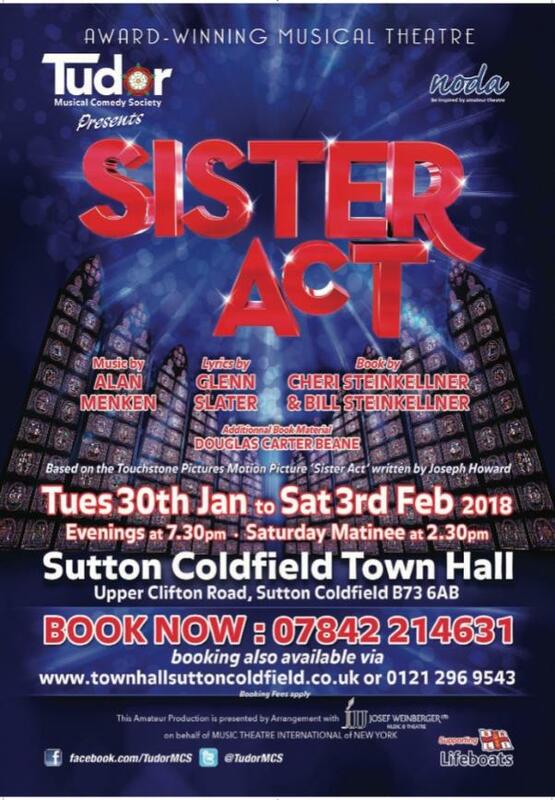 Tickets are now on sale and can be booked through our ticket secretary on 07842 214631 or can be booked online via www.townhallsuttoncoldfield.co.uk. Please do not hesitate to contact us if you have any queries regarding tickets or bookings. Tudor are thrilled to be bringing this fun-packed show to Sutton Coldfield Town Hall in January 2018. "... the show was amazing from start to finish and Eva had the time of her life taking part in it ... I was bowled over by the quality of it as were the rest of Eva's family who came on Saturday night ... thank you for making it such an enjoyable experience for her." "... Phoebe has really enjoyed being part of this production and the personal confidence she has developed is incredible. Thank you so much ... it's one of the best things that could have happened for her." " ... I just wanted to pass on my thanks for your hard work and investment in the kids ... Ruby thoroughly enjoyed the whole experience and she's learned so much from being in the show. All our friends and family loved the show and remarked on how professional it was." " ... Lucy had the time of her life! ... it was an amazing production. You should be very proud and we are very grateful that you gave her the opportunity."